Take this shirt and help us protect the pelagic threshers sharks in Malapascua and start a reef nursery! Thresher sharks are the most graceful and beautiful of all sharks. There is a reason why those who have sighted them are astonished: they traverse the water as if underwater samurais - poised and refined in movement with their lengthy katana-like tails. A few lucky ones have even witnessed them breach out of the water. The threshers visiting their cleaning station in Monad Shoal are the reason why divers from all over the world flock to Malapascua. Besides the diverse marine life around the island, they are the main attraction and help boost ecotourism and the livelihood of the locals. The presence of the threshers was also crucial in rebuilding Malapascua after Yolanda (typhoon Haiyan) and mean a lot to the community and the ecosystem. On top of being a vulnerable as a species in general, they are still sought after by illegal fishermen. Us at Divelink Cebu have partnered with Save Philippine Seas, Project Sharklink,Thresher Shark Research & Conservation Project, and Migo Sa Iho Daanbantayan Bantay Dagat Task Force to protect the waters around Malapascua from illegal fishing and have worked together to form a Daanbantayan Executive Order declaring Monad Shoal a shark & ray sanctuary. While that is huge success, we still need your support to continue funding the protection and research of these beautiful creatures. 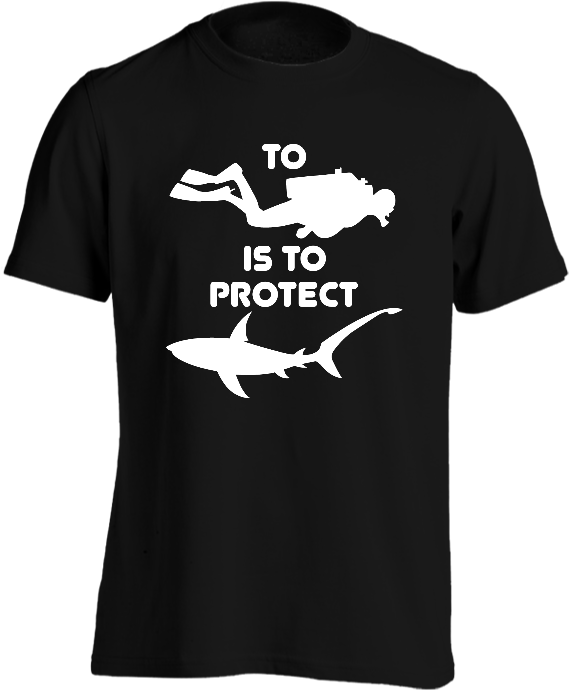 When you get a #DiveAndProtect shirt (or get two for free shipping), the proceeds go to protecting the threshers and to fund the starting of a reef nursery to even improve the quality of marine life around the island. Help the sharks & the fishes help us. They and the Malapascuan community will thrive with your support. The shirt is also available in navy blue. So why did we partner up with Teetalk.ph? Because of the causes they are supporting. First, they are using non-toxic paint on all the 100% cotton shirts they produce. Second, the shirts are proudly tailored by locals from Luzon. Next, the shirts come shipped in a nice cloth satchel which are also hand crafted by women from Rizal province in Luzon allowing them opportunity to earn money. Last but not the least, their shirt printers are their own inhouse college scholars. They are supporting a lot of locals with every shirt you buy. Divelink Cebu and Teetalk are under the same cause to support and promote the local community. They're like our long lost brother from another mother! So when you buy one shirt, not only are you funding shark research & protection and reef nursery creation, you are also supporting women and college students from Rizal. You should be proud you ordered a shirt. This is one amazing way to support multiple causes. The campaign runs for 60 days so hurry and order now!